When I first saw the promotional material for this movie, I was expecting a bloody romp through the world of Vikings but in actual fact it was a more surreal and intelligent journey about a mute warrior named One Eye who was played masterfully by Mads Mikkelsen. It should also be noted that Valhalla Rising is also a Danish movie and if you're one of those naysayers to foreign films, you might be pleasantly surprised with this cinematic story as the dialogue is actually kept to a bare minimum. 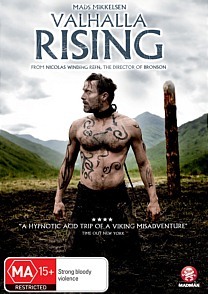 Given this fact, Valhalla Rising is quite an engaging story as we follow One Eye's story as he is freed from the shackles of slavery where he joins a group of Christian Vikings as they attempt to reach the lands of Jerusalem. Unfortunately their journey takes them to America instead of the Holy Lands which is where the conflict commences. Filmed in Scotland, the cinematography behind Valhalla Rising is visually quite stunning and its Earthy colours really help to enhance the story. Given that the budget of this film was that of an oily rag, director Nicholas Winding Refn has done a remarkable job and should be commended on this non-Hollywood masterpice. The video quality of Valhalla Rising is quite good for a film of this budget, especially the surreal dream scenes that look like some strange amalgam of a nightmare clashing with reality. Sound is presented in Dolby Digital 5.1 that at times booms, especially with the soundtrack. For special features, add in a behind the scenes documentary, commentary by director Refn and journalist Alan Jones plus the original theatrical trailer. All in all, Valhalla Rising was definitely a film left out of centre that I enjoyed thoroughly from start to finish with some extremely strong performances and exceptional directing by Refn. Audio commentary with director Nicolas Winding Refn and journalist Alan Jones. The Making of VALHALLA RISING.